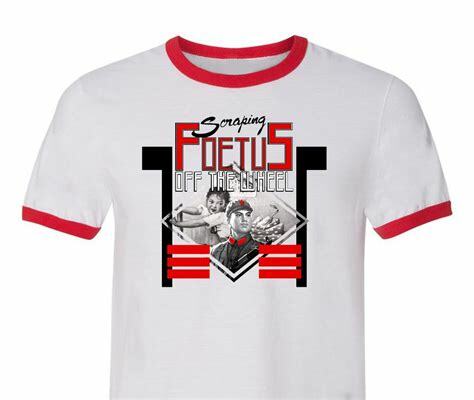 JG Thirlwell | Foetus HOLE T-shirt avaiable now! Ectopic Ents is proud to announce the release of the Foetus HOLE t-shirt. Celebrating JG Thirlwell’s acclaimed album from 1984, the HOLE shirt is a two color design, with classic red and black printed on a white ringer shirt with red neck and sleeves, making the wearer resemble a walking Foetus cover. This design has been long-bootlegged on garments, so we are thrilled to finally announce the official availability of this fine item. It’s a perfect conversation starter for your next cocktail party or doctor visit. It’s printed on a Anvil brand soft lightweight 100% cotton shirt, and is available in small, medium, large, XL, XXL and XXXL.